The gorge of Horseshoe Creek, in Leona Heights Park, is unusually grand for its size. Its rugged rocks, mostly Leona “rhyolite,” are pretty homogeneous though. So when a spot along the stream caught my eye with its color — reddish red and bluish gray — I went off the trail and checked it out. Notice that the surface is cut into the hillside. This streamside lump looked just like concrete. But there was a lot of it, in different states of preservation and age, so I took it as a natural deposit. It was hard, but a little higher up I was surprised to find soft material. Not just soft, but pure clay. 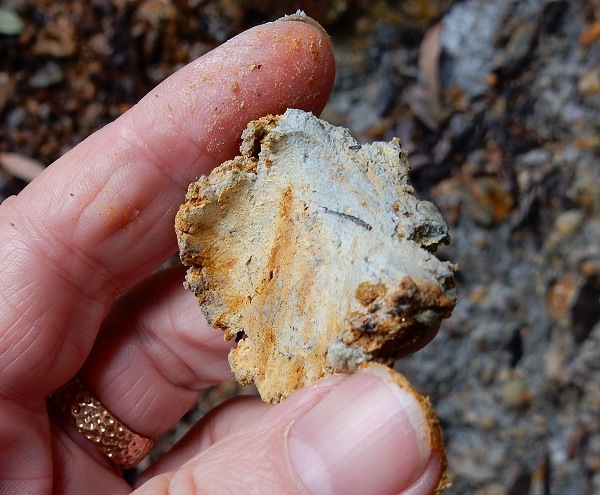 The high-silica lava and volcanic ash that makes up the Leona should weather into kaolinite (white china clay), especially under acidic conditions. We have that combination in parts of the Leona that are rich in pyrite. This mineral, with the formula FeS2, reacts with air to form iron oxyhydroxides and sulfuric acid (here’s a brief treatment). 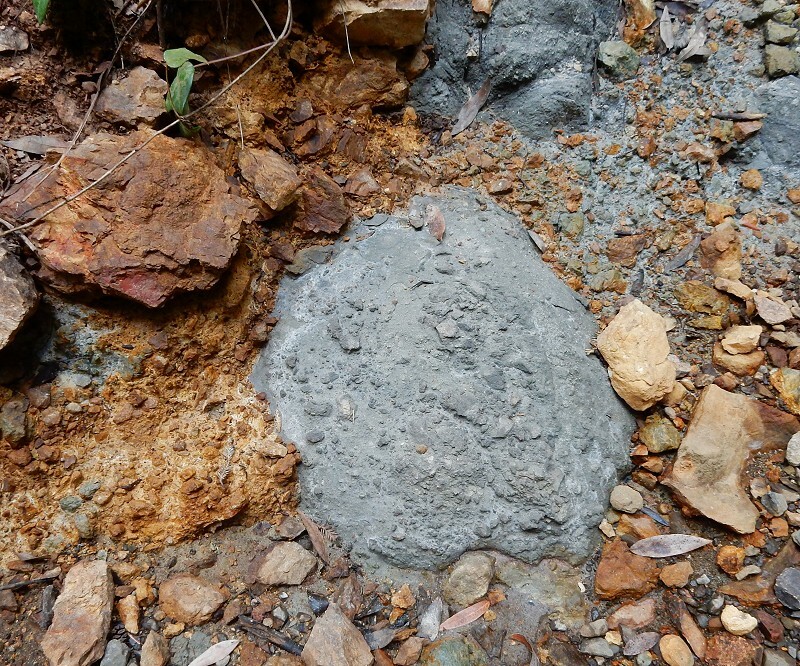 There may be a pod of rock here with a different texture or composition from its surroundings, which might account for the purity of the clay. But I don’t actually know how pure the clay is. The way to tell would be nibbling it. Maybe on my next visit. I think that a gradient in pH, plus interactions with air and surface water, explains the transition from gray to white to red clay as you go from depth to the surface. Without a lab, there’s not much I can say about it, although geologists with more experience probably know this stuff cold. If so, speak up. 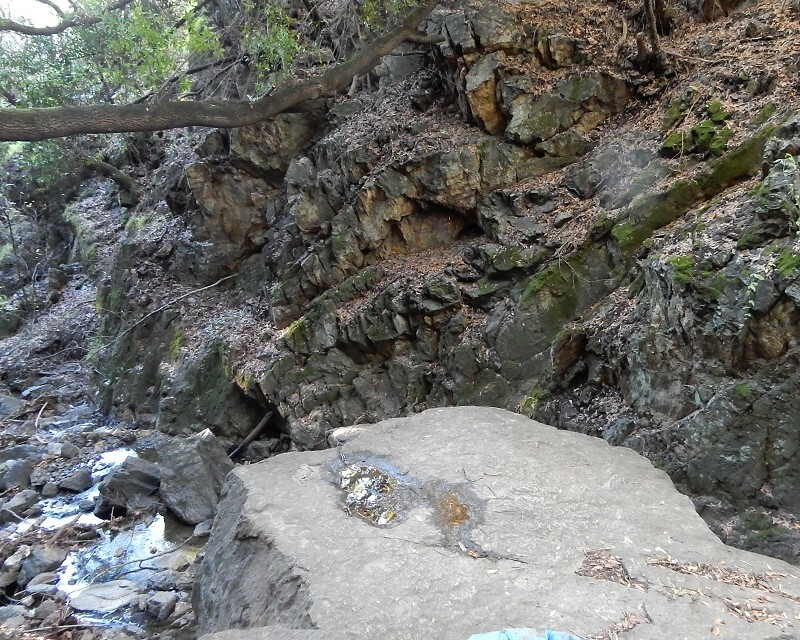 There was another piece of evidence at the scene, though: a bit of leaking “yellowboy” from the floor of the streambed. 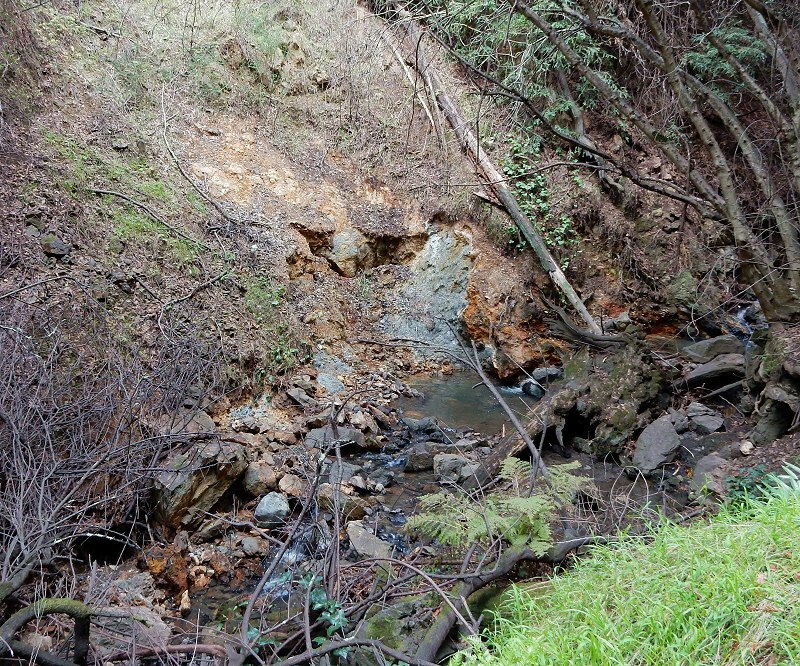 It means there’s a little bit of acid drainage here, not up to the level of the ex-sulfur mine just south of here. More like a geologically slow bit of natural acid drainage. It will be interesting to watch this spot during this wet winter. This entry was posted on 25 January 2016 at 8:03 am and is filed under Leona volcanics, Oakland geology puzzles, Oakland's soil. You can follow any responses to this entry through the RSS 2.0 feed. You can skip to the end and leave a response. Pinging is currently not allowed.